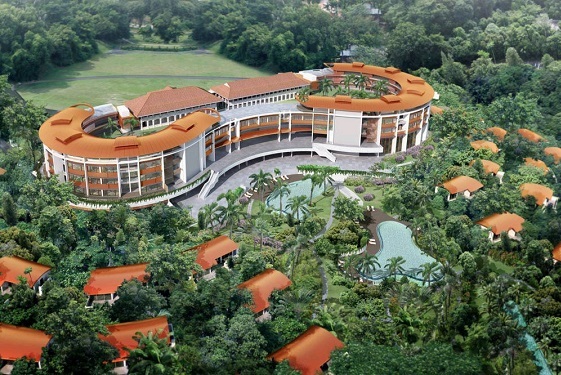 US President Donald Trump and North Korean leader Kim Jong Un have chosen Capella Singapore on Sentosa Island off the coast of Singapore as the venue for their historic summit on Tuesday (June 12). It is a choice which might surprise some. The boutique resort hotel is not as grand as The Raffles (currently under renovation) or as iconic as Marina Bay Sands (with its famous rooftop pool). However, having checked into the designer hotel a mere three weeks before the dynamic duo The Luxury Travel Bible can report it is the ideal venue. If anywhere can soothe the savage spirit and engender feeling of good will and entente cordiale it is Capella Singapore with its peaceful location and ultra-efficient but friendly staff. Plus Sentosa is Malay for ‘peace and tranquillity’ which has to be an auspicious sign. After a stay in one of the resort’s one-bedroom villas I can attest to being so relaxed I would have been ready to negotiate over almost anything. The colonial façade of Capella Singapore comes into view up a sweeping driveway and its hilltop perch ensures panoramic views of its surroundings. Vistas over the port of Singapore, the South China Sea and the emerald rain forest of Sentosa Island are restful for resort guests and a godsend for security. There’s enough open green space and convenient bushes here to hide a wealth of secret servicemen. There is always a (literal) red carpet for arriving guests at Capella Singapore but rumour has it the original 1880s building has had a fresh coat of paint in preparation for June 12. The 30-acre, 112-room resort has a modern wing designed by renowned British architect Norman Foster and tiered pools created by the late Indonesian designer Jaya Ibrahim. Inside, colonial architecture mixes with impressive pieces of modern art and East meets West in perfect harmony - a fit setting for the upcoming talks. 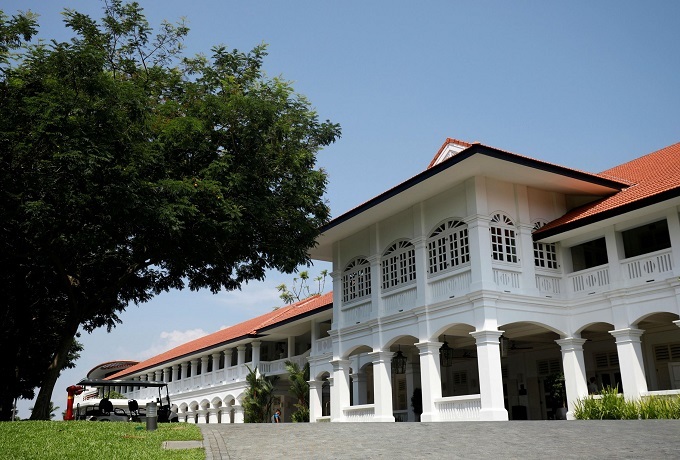 The hotel is a favourite weekend getaway for Singaporeans because it is only a short taxi ride from the downtown area but a world away in terms of natural beauty, peace and quiet. Its Sunday brunch is legendary. I am over-whelmed by the bounty of the brunch with a buffet piled high with everything a weekender’s heart could desire and circulating trays of cocktails and cakes. An evening at the beautiful Cantonese Cassia restaurant under the wing of Executive Chinese Chef Lee Hiu Ngai is another treat and The Knolls has superb international cuisine, so another big tick on the food front: well-fed world leaders are always more inclined to be reasonable. President Trump doesn’t drink so the Cuban vibe of Bob’s Bar will have less appeal, although they do mix a mean mocktail. One afternoon as the rain gently falls I head to the Auriga Spa & Wellness centre, the perfect place to relax and detox on a wet day in the tropics. Innovative Lunar treatments balance guests' natural rhythms to that of the phases of the moon, which would surely be helpful for stressed-out dignitaries. Although, sadly, asking them to partake of the sublime two-person Senja Sunyi Ritual might be a step too far. On my last morning as I breakfast on the terrace beside the pool, one of the resident peacocks struts past, his jewel-bright tail trailing, his azure head held high. “I am king of all I survey” says his stance, “the most important being in the whole of Sentosa". Luxury Facts: Although Capella Singapore is hosting the summit, it looks likely that President Trump might actually stay at Shangri-La Hotel. The hotel's presidential suite, called the Valley Wing Shangri-La Suite has a private entrance and lift and has also hosted former US presidents Barack Obama and George H.W. Bush. TLTB has also checked in to the Valley Wing. Read the story HERE. Kim Jong Un is being tipped to stay either at the Fullerton or the St Regis. Ultimate Luxury: One of Capella’s presidential suites, the Colonial Manor, is architectually traditional on the outside, with lush interiors decorated with Asian art and furnishings. Most Indulgent Moment: The Auriga Spa’s signature lunar treatments. Insider Secrets: The Colonial Manor is a standalone property which can't be entered by most hotel guests, making it private and secure. It is the perfect place to host conversations between two world leaders… just saying. The Little Things: Staff quickly learn the names of every guest so the whole experience seems intensely personal like having your own Singapore mansion.